Wireless Networking with OS/2 and eCS. WiFi, the term is mentioned everywhere nowadays. Unfortunately, taken a look at the specifications of wireless devices on the manufacturer's web site, Windows-only is stated very often. Does this mean wireless networking is impossible with OS/2, UNIX and Linux? Not at all! A whole variety of drivers that enable use of most wireless network cards available today will soon be available for the OS/2 Warp platform. This article will introduce the drivers that are already available and that work excellent. But just because the technology is available for OS/2, that doesn't mean you must rush to your local computer reseller, and switch your network to WiFi instantaneously. People who have some insight in the networking branch will tell you to keep security issues in mind. It is my intention to have this article easy to read for everyone, both the novice and expert OS/2 user, while still giving complete detailed information. Also, if you're already familiar with some of the topics, you can skip them and pass on to the next sections. A short introduction to Wireless. What you should think of when choosing a WiFi cards. Drivers for setting up a Wireless Device. Security restrictions? What about encryption? Where does this leave us with OS/2? 1. A short introduction to Wireless. Wireless networking... Just as with wired networking, you need Network Interface Cards to communicate between two nodes (computers) in a network. The difference is that with wireless networking, you don't need wires anymore. However, before we can discuss the compatibility between OS/2 and wireless network cards, we should tell you something about how it works. A wireless network card is in fact an ordinary radio. A radio that has been modified to serve for computing and communications needs, that is able to transfer data. If you look well, you'll discover that every wireless network device (both PCMCIA card, PCI card, and Wireless Access Points) come with an antenna, sometimes very small and well-hidden (under the black plastic cover of the PCMCIA card). This antenna is being modulated; and as a result, radio waves are being produced. Now, an ordinary radio transmits data. The data is just sent in a particular format, and is then later decoded as sound. In fact the data being sent is just a digitized form to send data, and the "decoding side" of the system interprets the data sent via waves in a particular format. We will now further compare WiFi devices to radios to give an abstract overview of the basic technologies behind wireless networking. You've probably already heard the terms AM and FM radio. Terms like VHF and UHF television, citizens band radio, short wave radio and others may be a little less familiar, but in fact these terms are all related on the same thing: radio frequencies. And also wireless networking is related to this subject. GSM (mobile phones): 900, 1800 and 1900MHz. Megahertz (MHz) means "millions of cycles per second," so "91.5 megahertz" means that the transmitter at the radio station is oscillating at a frequency of 91500000 cycles per second. Your FM (frequency modulated) radio can tune in to that specific frequency and give you clear reception of that station. All FM radio stations transmit in a band of frequencies between 88 megahertz and 108 megahertz. This band of the radio spectrum is used for no other purpose but FM radio broadcasts. There is however a very good reason why all of these wireless technologies use strict government-regulated areas of the radio spectrum: imagine you could control the airplane that flies above your home when you press the button of the remote control to open your garage door! I think we needn't explain further? This event is called interference. This is why wireless networking has been assigned a specific place in the image at the right, representing the radio frequency spectrum. It has been assigned a specific band of 2.4 GHz and 5 GHz. However, later in this article, we will remark that some devices use the same frequencies. This could result in interference, and you'll find more about that in section 5.1.2. EMI. Also note that the electromagnetic spectrum also includes visible light, and infrared light in the very high frequency ranges. Unlike the impression many people have that wireless LANs are a very new technology, it has already been around for some ten years now. Wireless LANs have been used for years in several markets such as health care, academia, warehousing and retail. About two to three years ago, it has been realized that this technology could be a general-purpose connectivity alternative for a broad range of business. There are two principal standards for wireless connectivity available today: BlueTooth, and IEEE 802.11 (pronounce as: "I triple E 802 dot 11") wireless Ethernet. In the next few sections, I'll briefly try to explain these standards. For more in-depth information, you can find links to interesting web pages at the end of this article. Today, people tend to speak about WiFi. This abbreviation is a term that covers all wireless solutions available today. BlueTooth is a wireless technology developed by Ericsson, Intel, Nokia, and Toshiba that specifies how mobile phones, computers and PDA's interconnect with each other, with computers and with the office or home phones. The technology enables data connections between electronic devices in the 2.4 GHz range. BlueTooth is the de facto standard for very low powered and radio connections that can link your PDA, mobile phones and laptops, and that can enable Internet access via hot spots. (A hot spot is kind of an antenna for mobile phones; the only difference is that you can connect via such a hot spot to the Internet via a fixed network connection. This means a true revolution for mobility!) The original BlueTooth 1.0 specifications were set in 1999, but the first products were only available on the market early 2000. BlueTooth was designed for low power consumption, thus limiting range therefore. It was not created specifically for wireless LAN technology, but with the right software it can be used as one. One of the problems with BlueTooth is that it has only a throughput of 800Kbps, thus it will never replace wireless LAN equipment. In the long term, BlueTooth is expected to be built in a chip e.g. on the mainboard of a notepad or a cellular phone. In short terms, it will be added using PC cards or USB adapters (USB 1.1 doesn't impose performance limits, due to the limited bandwidth BlueTooth offers). BlueTooth's native ad hoc network property makes it a very convenient way to replace those cables at home, for giving printing support at hotel or acting as an ID card at a shopping centre, but this jeopardizes security. IEEE 802.11 WLAN also supports ad hoc networking, and can be used likewise, but the main stream of IEEE 802.11 developers is not focused on that subject. Basically, WLAN is an ordinary LAN protocol which is modulated on carrier waves. Since this article is specifically about compatibility between OS/2 and wireless devices, I shan't discuss the technical details further. There are a great deal of good books about that topic, some of them are referred and linked to at the end of this article. WLAN stands for Wireless Local Area Network. WLAN IEEE 802.11 is a natural extension to LAN Ethernet, and the modulated protocol is IEEE 802.3 Ethernet. Actually, there are three IEEE 802.11 standards that cover FHSS (Frequency Hopping Spread Spectrum), DSSS (Direct Sequence Spread Spectrum), and infrared technologies. At present, there are not any products available that come with the IR (infrared) technology implemented. In those three standards, IEEE 802.11b is considered to be the most widespread and accepted. It is the only using DSSS technology and CCK (Complementary Code Keying) modulation to achieve it's high data rates. Since the technologies mentioned here (DSSS, FHSS, et cetera) are self-explanory using a basic knowledge of Physics, I won't explain them later during this text. Should you want more information, you can consult the online FAQ, where these technologies are explained. Common WLAN products, which are using the IEEE 802.11 standards, are based on the IEEE 802.11b specs. Now, consider the diagram labeled "A vs B vs G". This compares IEEE 802.11b, 802.11a (an equivalent European technology under the name HiperLAN2 also exists; High Performance Radio LAN), and - the newest - 802.11g. IEEE 802.11b was the first of these three. The next generation of the standard, IEEE 802.11a, operates in a new brand of frequencies at 5GHz, and it achieves as high data rates as 54Mbps, in contrast to the maximum of 11Mbps for the b-standard. It uses OFDM (Orthogonal Frequency Division Multiplexing) as opposed to spread spectrum used in BlueTooth, IEEE 802.11 and IEEE 802.11b. This is the reason why IEEE 802.11a and 802.11b cannot co-operate. Note, however that certain products are available that comply to both the a and b/g standards. However, at this moment of writing, there is no OS/2 support for that. The IEEE 802.11a standard is incompatible with both others, since it uses a different spectrum and frequency. The b- and g-standards can operate together, though limiting speed to 802.11b, thus 11Mbps (you can see it as a Hi-Speed USB device you use on USB 1.1 port). Just as BlueTooth, this wireless solution is planned to be built-in in the future (the recent Intel Centrino technology is not really a built-in solution: the wireless feature of the Intel PRO/Wireless 2100b v3 card is implemented as miniPCI, which is kind of a PCI extension card). The IEEE 802.11x branch is now shipped as PC cards, and soon the wireless connection will be built in in notebooks. In fact, the IBM miniPCI Wireless card is a first step in that direction. Also, CISCO announced to release a wireless mobile phone based on the b-standard rather soon. Anyway, the first standard was 802.11b. When wireless networking gained popularity, manufacturers wanted to offer their clients higher speeds, and thus they did what was most obvious: change the frequency. They almost doubled it, which causes the waves to be modulated much much more faster, so that more data can be "put" on the wave(s). However, there is a Physics law that says that when the frequency f increases, the wave length decreases. This implies the reason why IEEE 802.11a has a significant smaller range than the b, and g standards, and why both b and g standards have the same range. Other frequencies also implies the two technologies are not compatible with each other, so that's why the g standard was developed later; manufacturer had to give an answer to the ever increasing demand of a faster but compatible technology with the b standard. Adds the QoS (quality of service) that keeps an eye on the quality of the connection, so that specific data streams get acquainted with a minimum bandwidth. These devices will soon be available onto the market. Official IEEE description: Enhance the current 802.11 MAC (Media Access Control) to expand support for applications with Quality of Service requirements, and in the capabilities and efficiency of the protocol. The 802.11f standard's final goal is to make WLAN devices of different manufacturers work better together. Official IEEE description: Develop recommended practices for an Inter-Access Point Protocol (IAPP), which provides the necessary capabilities to achieve multi-vendor Access Point Interoperatability across a Distribution System supporting IEEE P802.11 Wireless LAN Links. Should become the European counterpart of the IEEE 802.11a standard. Only, h adds some advanced technologies to prevent interference with satellite-communication. Official IEEE description: Enhance the 802.11 Media Access Control (MAC) standard and 802.11a High Speed Physical Layer (PHY) in the 5GHz Band supplement to the standard; to add indoor and outdoor channel selection for 5GHz license exempt bands in Europe; and to enhance channel energy measurement and reporting mechanisms to improve spectrum and transmit power management (per CEPT and subsequent EU committee or body ruling incorporating CEPT Recommendation ERC 99/23). The 802.11i variant promises more powerful and more secure security measures for encryption and data protection than the current a-, b-, and g-standards that still lack secure solutions due to the limited WEP technology. Official IEEE description: Enhance the current 802.11 MAC to provide improvements in security. As you can see, it's hard to see the woods for the trees with the diverse range of standards! In fact, it's only last month that the IEEE decided to make IEEE 802.11g the official one-and-only standard. 1.3. 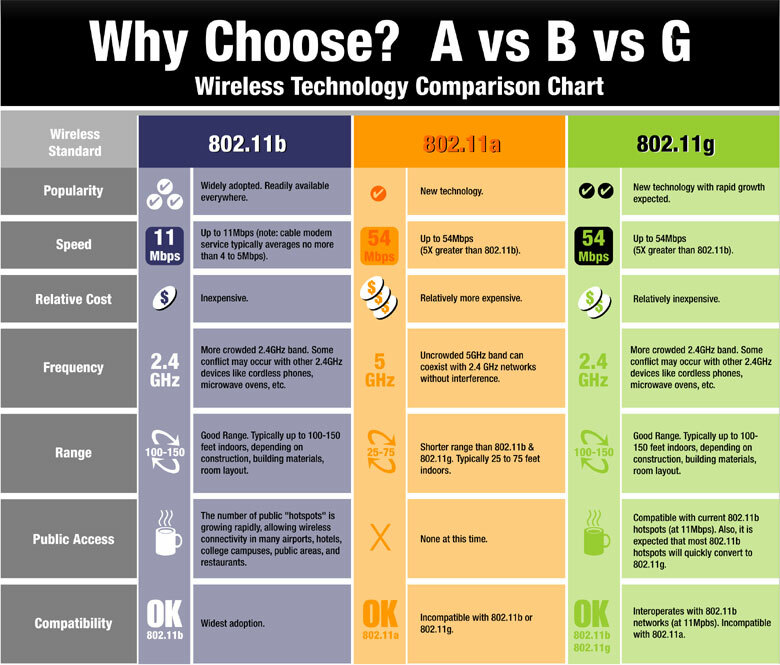 WiFi - BlueTooth comparison. There are three major aspects that I will discuss here. Surely, others do exist, but in my point of view, they are irrelevant here. IEEE 802.11x WLAN is clearly faster than BlueTooth. The original IEEE 802.11 network cards can transfer data at rates from 1 to 2Mbps (using for example PRISM1 chipsets). IEEE 802.11b can deliver speeds @11Mbps. However, you must keep in mind that this maximum is not always the case. Walls, the air in the room, dust, magnetic and electric fields can jeopardize the waves of the wireless device and thus weaken the signal, and causing data transfers at lower speeds. There are also IEEE 802.11b devices that double the 11Mbps performance, but these use chipsets that are not supported yet under OS/2. As the previous diagram illustrated, IEEE 802.11a can give you speeds of 54Mbps, and 802.11g is operating at this speed too. And what about BlueTooth then? It is suggested that BlueTooth's throughput is around 720Kpbs. Of course, just as is the case with IEEE 802.11x standards, air conditions can limit data transfer rates. Using a Wireless Access Point (see later for more information), the total available bandwidth of 11 or 54 Mbps is divided among the devices connected to the wireless network. Often, the waves of wireless devices are presented in concentric circles around the antenna (Compare it with dropping a small stone in a lake of water, the water ripples on then.). That includes that data waves are spread around the device; hereby, it comes that security must be kept in mind, and this issue will be discussed later. Range actually is the same thing as the radius of the far-most circle around the antenna. As was already said, BlueTooth is designed to use very low transmission power. This implies that the maximum transmission range will be around 10 meters. Perhaps, if later version of the standard appear, they may allow longer ranges. High-powered BlueTooth would extend the range to 100 meters. IEEE 802.11x normally has a transmission range around 15 to 150 meters indoors and 300 meters outdoors. I already pointed you at some factors that can reduce data transfer speeds, and also, these very same factors can limit the range too. To give you an idea of the power consumption: BlueTooth uses 1 mW, compared to 1 W in Americas and 100 mW in Europe for IEEE 802.11x. One small note here: a Wireless Access Point (more information later on), a box with one or more antennas has sometimes NOT a range that reaches/covers some area in the form of a circle, but in an oval. Most WAPs come with two antennas, that each cover an area in the form of a circle, and you could just accept that it covers an oval instead of circle as range area. So I can explain this aspect thoroughly, you should first be familiar with the OSI model. OSI is short for Open Systems Interconnection Reference Model. It's a seven-layered theoretical model that summarizes networking protocols, and helps to facilitate the development of new ones. Now, the first layer, and immediately the base for the whole, is the physical layer. This layer establishes, maintains and terminates point-to-point data links. The second layer that lies on top of the first one, is the data link layer. This layer is used for the logical link and medium access control. The third layer lies again on top of its previous layer (as is always the case) and establishes, maintains and terminates end-to-end network links. That's why it's called the network layer. The fourth layer is the transport layer; it ensures reliable end-to-end networking. Next, the session layer establishes, maintains and terminates node-to-node communication (in other words: it makes computers branched to a network chat to each other). The presentation layer provides network communication services, e.g. translations, encryption, and compression. And the upper layer, the application layer provides user services for applications. Thus, the lower layers are hardware, technically enabled, the upper ones are all software related. Now, for BlueTooth, the security setup is done in the software/application layer. This means that software is required for security. For IEEE 802.11 networks, they are based on the absence of privacy, since the access point of data and information is a wire in the office, and the data can't go out of the wire, unless at either two ends of the wire. IEEE 802.11 standard includes an optional encryption feature called WEP (Wired Equivalent Policy), which can be implemented by embedding RSA's RC4 security algorithm in the MAC (Media Access Controller), thus implemented in an OSI level BELOW the application layer. The passwords are stored in the access points and on each mobile computer. It encrypts the transmissions between the access point and the mobile devices. All the devices are using the same password in a network. Obviously, the encryption doesn't give much security in public networks, since they would have to publish the password. WEP uses a 64-bit encryption key, though other bit rates can be used (e.g. 40, 128, and even 256). Now, who is the most secure? I'd say BlueTooth, since it has a very limited range, and thus the waves can't go far from the destination, thus limiting the possibilities for others to "find the data in the air". Nevertheless, technically seen, BlueTooth is not secure at all; configuration of the security software only begins in the upper layer of the OS, which is not good at all. All in all, IEEE 802.11 standard is better suited for wireless local area network applications. It is much faster and gives a wider range of use. On the other hand, BlueTooth's natural ad hoc connectivity makes it fewer configurations, and gives it good usability in many new applications. Security can't be said to be better or worse on either of the two technologies. There are advantages and disadvantages. We could say that they are equal. In fact, BlueTooth is a great technology to be used in wireless mice et cetera, while the WLAN alternatives are great solutions for networked connectivity, like hot spots. Nevertheless, on OS/2, you'll only get IEEE 802.11b going (for now). IEEE 802.11b, also known as WiFi and AirPort, 802.11b is a popular wireless transmission protocol. 802.11b uses radio frequency technology to communicate through solid objects at a rate of 11Mb/s and a distance of several hundred feet. It is primarily used for TCP/IP, but can also handle other forms of networking traffic including file sharing. The operating distance is much greater, at distances of up to 150 feet vs. Bluetooth's 7-10. Power consumption is much higher for 802.11b than Bluetooth. This is an issue for low-powered and battery-operated devices. HomeRF is a low-cost wireless networking solution, which operates on the 2.4Ghz band over distances of up to 150 feet. HomeRF is designed to occupy a middle ground between 802.11b and quasi-networking protocols such as Infra-Red and Bluetooth. HomeRF's power is that it supports voice and audio transmissions natively. Even though it draws more power than Bluetooth, the operation speed is only 1.6Mb/s, 2.0 standard at 10Mb/s is not widely adopted. Infrared (IR) is the electromagnetic spectrum situated exactly between radio waves and visible light. It can be used to communicate between two or more devices equipped with IR ports. Some of IR's advantages are the extreme low prices, the tremendous bit rates (up to 2 Gbps!). The short distance and inability to pass through walls, while also disadvantages, are advantages by decreasing the ability of hackers to access your data, and therefore increasing security. IR requires a clear line of sight between devices, versus the larger area available over an entire radius. Current IR protocols operate at up to 4Mb/s, which is four times the bandwidth of Bluetooth. Ethernet is a local area network (LAN) technology that transmits information between computers at speeds of 10 and 100 million bits per second. Currently the most widely used version of Ethernet technology is the 10Mbps twisted-pair variety. The name Ethernet is derived from the word ether as a means of indicating the directions in which data can travel. Ethernet is an established, robust standard that scales well, from two machines to thousands. Because of its wide-spreading, Ethernet is cheaper than cheap; more to say, the network cards are almost for free. However, Ethernet requires physical cables to connect devices, negating any benefits of a wireless solution, and cabling costs can quickly outweigh any cost savings over a wireless solution. Bluetooth is the industry name given to a royalty-free wireless communication specification for home and office connectivity. Bluetooth uses low-power transmitters and short-range radio links to replace the cable(s) connecting portable and/or fixed electronic devices. Bluetooth was developed in 1994 by L. M. Ericsson of Sweden. The technology was originally envisioned as a cable replacement technology linking multiple devices wirelessly for synchronization, data transmission and file transfer. In recent years, applications have developed from linking cellular phones with computers to connecting microwaves with refrigerators. BlueTooth is as popular as WiFi IEEE 802.11b. 2. IEEE 802.11b supported devices. At this moment, there is good support for the most important chipsets used in IEEE 802.11b WLAN products available today. The Orinoco chipset by Lucent/Agere (in fact just a PRISM chipset with enhanced firmware by Lucent/Agere) is supported fabulously! There are several specific drivers available for specific products (e.g. the Artem ComCards, the IBM High Rate PC Card 128, Bintec X-Air, ...) and there are also modified drivers available that allow you to use (any) card equipped with that chipset. There are also two business driver for the CISCO 340 Series of WLAN products, which will also work with the 350 Series. The oldest driver is available from IBM under business contracts, or - perhaps - it still remains somewhere on the Internet. The newer driver is still in beta phase and offers support for both 340 and 350 series PCMCIA devices. These CISCO devices use the AiroNet chipset, which is also a spin-off of the PRISM chipset (with CISCO-specific firmware). The older device driver works only with these devices, and not with other similar devices from other brands that use the same chipset :( The new CISCO driver for the 340-350 series supports the specification of manufacturer and device IDs, so it's kind of a generic device driver for the AiroNet chipset. And then, there's the PRISM series of chipsets. Although the Orinoco and CISCO chipsets offer weigh better performance than the PRISM chipsets due to improved firmware, these chips are used in a lot of products due to their low price. There is a specific driver for the IBM miniPCI Wireless adapter, and a spin-off of this driver enables you to use (any) PRISM2, PRISM2.5 and PRISM3 card! Of course, we must be careful to say "any"! There are some remarks, though. Devices that use a mixture of chipsets won't work correctly. When using the Generic PRISMx beta driver, you must make sure your device has a PRISM chipset from the Intersil brand, thus being equipped with Intersil firmware, that is required for the drivers to work correctly. Most DLink products use an Intersil PRISM chip, but use TI firmware, thus causing instabilities when using the device, and lockups during large file transfers. However, with the Release Candidate of the Generic PRISM device driver, you can also use PRISM chips with Lucent/Agere firmware (= Orinoco chips). For some WLAN cards, you'll need two hexadecimal numbers: the manufacturer ID and the device ID. These IDs are used by the driver during initialization of the driver; it searches for the device by polling these two numbers (only the beta generic drivers require these IDs). For Orinoco chip, these are respectively 0x0156 and 0x0002 most of the time (though other variants can occur). With PRISM chipsets, these numbers can vary greatly. Thus, for simplicity, there are made especially adapted device drivers for the NetGear MA-401, and the Linksys Instant Wireless Adapter WPC-11 V3. I'll give more information about these IDs later in this article. Other chipsets like TI solutions, Atmel, or ISA to PCMCIA board using the Omega chipset are not supported at the moment. However, development of an Atmel driver is planned for the future. One last thing: most of these drivers mentioned here are not available to the public yet. The Artem OS/2 driver has been available for some two years now. This driver only works on Artem hardware, and on hardware sold by some daughter companies (BinTec, SteinKeuhler). Also, IBM has published its miniPCI driver and High Rate 128 PC Card driver on Device Driver Pak website, but all the others are still in development or IBM internal beta testing and/or only available via IBM business contracts. The Generic PRISMx device driver should be published via SoftWare Choice really soon. There is one dangerous remark however: IEEE 802.11b has maximum transfer rates of 11Mbps. Now, some companies like DLink claim that their b-standard cards can get to 22Mbps. 22Mbps is the so-called IEEE 802.11b Enhanced standard. These devices won't work on OS/2, since they use an additional chip (the TI ACX-100) to "over clock", as a matter of speaking. Meanwhile, TI has also launched a new chipset for the IEEE 802.11g standard that increases the speeds up to 100Mbps, which - of course - won't work neither. And then, of course, there are also plenty of wireless access points, like the LinkSys WAP11 v2.2 which can be attached to a computer, work as DHCP-servers, and who offer built-in web based configuration pages. *: Development for driver is planned. **: Not a real WiFi chipset; chipset used for special PCI-to-PCMCIA bridges. For maintenance reasons, we decided to host this information on a different page. Please visit http://www.os2warp.be/index2.php?name=wifidevs for the most up-to-date listing of approved OS/2 tested WiFi hardware devices. You can also get technical hardware support there. 3. What you should think of when choosing a WiFi card. For use with OS/2, pick out PC Card NICs according to the IEEE 802.11b standard. For a wireless access point (WAP) go for a web-based configuration utility and a router that is according to the IEEE 802.11g standard, since the g-standard is backwards compatible with the b one, and since it offers considerable greater bandwidth that is shared amongst the devices in the WLAN than a traditional 11Mbps Wireless Access Point. If you know the details about the chipset, choose the AiroNet (CISCO) or the Orinoco (Lucent, Agere) chipsets, which are great enhancements over the Prism2/2.5 chips, or PRISM3. Generally, the greater the range, the better? But caution is required here: the higher the transfer rates at far distances, the better the quality of the card is. Normally, you should be able to get 350 m with a data transfer rate at 1Mbps. Actually, the requirements do vary for each person. If you are an exigent user like me, someone who is prepared to spend a lot on hardware so to get the best, some hardware freak, then you best pick out CISCO or LinkSys. CISCO is the most expensive, but combines flexibility of use, professionalism, great range, and 128-bit WEP. Drivers are available from IBM under business contracts. LinkSys has even greater range, but less good performance (though also extremely well). LinkSys also is a lot cheaper then CISCO. If you want real support for OS/2 and eCS, so if you want to play safe, pick Artem. Good price/quality ratio, and fabulous OS/2 support. They also have a great free driver which they are supporting for out-of-the-box for OS/2(!). If you want a good home connectivity for low price, with good support (no OS/2 support though, but internal device details), pick out NetGear. If you're a network administrator, pick out CISCO, or choose the cards with WEP encryption at the highest bit stream. Also buy a book about wireless networking security issues, or spend some days studying CISCO's white papers related to the issue. Before investing in WiFi, you should be well-informed about the security issues, so I really recommend you read the paragraphs about this subject later on in this document. For an access point (AP), you must make sure it has a web-based configuration interface. No software at all! Please remember this, since everything must be configurable from within your web browser. For these devices, you can opt for IEEE 802.11g, since it is backwards compatible with IEEE 802.11b. This won't increase the speed between g and b but the regular 11Mbps. Please note that this article attaches more importance to PC Card WiFi devices than APs (Access Points; most APs come with good documentation, and needn't have drivers installed, thus every working of an AP is vendor dependent). You can buy IEEE 802.11b enhanced WAPs to connect OS/2 IEEE 802.11b PC Cards to, together with enhanced cards running on Linux, or Windows. Please read on in the next part of this review. Last modified: 2004/08/30, 18:20 | This site is sponsored by Mensys B.V.